In a previous post, I promised a look at our own games and the politics that they present. In our first post, we’ll take a look at Rockalypse, the Fate-powered game of post-apocalyptic musical conflict. I’ll do this using the three categories listed in that post: Premise, Action, and Presentation. There are several elements that go into the premise of Rockalypse, many of which are quite overt about the game’s politics. But there are a few more subtle guiding elements as well. The most overt choices come into play right in the elevator pitch: “post-apocalyptic game of musical conflict.” Whenever you create a setting that is post-apocalyptic, you make an assumption that there was, in fact, an apocalypse. There are many forms that an apocalypse can take, but most carry with them the inherent bias that there will be some sort of cataclysm brought about either by human systems or external forces. This rules out many forms of gradual decay, as well as the possibility of intervention. Post-apocalyptic settings are, in many ways, cynical. Similarly, the inclusion of “conflict” in the core description conveys certain assumptions about problem resolution. Though it may be possible to include peaceful solutions, they are clearly not going to be the core mode of play. Conflict is seen as inevitable, which is also a negative view of human nature. On the other hand, Rockalypse clearly and repeatedly communicates a subversive take on the cynicism described above. By exploring the idea of conflict specifically through music, this game redefines victory and defeat in non-lethal terms – an uncommon approach for a roleplaying game. This subversion is at the heart of Rockalypse, and everything about the game centers around it. Some of the more subtle political choices of the game’s premise occur in the setting creation section. Ostensibly, this game offers unlimited options for viewpoints to be played at the table, since the players create their own setting as part of game creation. However, the options and examples that Rockalypse includes display a particular slant. In many of them, the status quo is presented as oppressive and exploitative, with the heroes pitted against authoritarian power structures. None of the listed setting aspects offer the heroes an opportunity to support authority, and many of them are specifically about breaking it down. The modes of authority vary, but include such examples as corporatism, bureaucracy, fascism, and imperialism. Casting these things as “evils” to be overcome is very much a political choice. Some of those concepts built into the premise speak to the overall action of the game in terms of plot, but you can also find political choices in the moment-to-moment decisions and mechanical elements included in Rockalypse. As I said, the word “conflict” is right there in the pitch, and making a game about fighting others in any way is a political choice. It suggests a world where not everything can be resolved through reconciliation or restorative justice. But the action of Rockalypse is also inherently collective. It is not designed for one person to save the day or to “get the kill,” but for the group’s impact to be crafted together at every step of the way. Each band member is respected and highlighted for their unique contributions to the whole, but no individual carries more of the credit for victory than any other. And that’s the point. And this brings us back to the choice of non-lethality, which is not simply a premise – it is baked into the mechanics. People are not injured or killed in Rockalypse. They are defeated and overcome, yes, but not killed. This alone distinguishes the politics of this game from many other roleplaying games. The way this happens is through the selection of the Fate system itself, which allows for the damage and consequences to be mental and emotional rather than physical. This not only avoids lethality, but also validates the idea that mental and emotional trauma are just as real as physical. And while you are still playing a game where you inflict that trauma on others, this whole approach dramatically changes the perspective on the idea of “damage” in roleplaying games. Rockalypse wears its politics on its sleeve in terms of presentation, starting with the art. When I first talked to Lauren Brown about the direction for the sample characters and cover for the public beta, I specifically told her, “I don’t need to see a white guy on the cover.” I hired her for all of the art elements that would provide direct examples of the players themselves, both in and out of character. I talked to her about making those elements as diverse as possible in terms of ethnicity, ability, and gender presentation, and she did fabulous work. I gave less direction to Chris Fennell on the genre splash paintings, because I was willing to let some white dudes creep into the mix there. But even after tallying those images (including the very Norse-filled Ragnaröck piece), the overall distribution of character art in the book still ends up majority people of color, and I am quite happy with that. I did a couple of intentional things with the writing to diversify representation throughout the game. First, I wrote the examples of play specifically with this in mind. 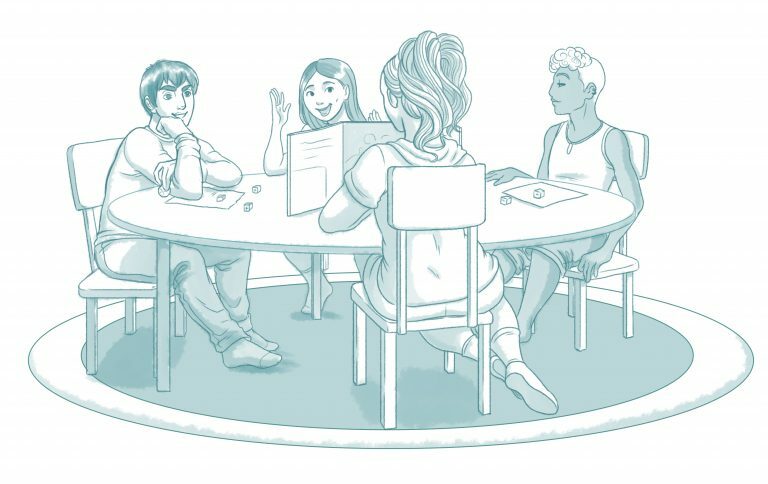 I built the characters to represent a variety of identities – even including asking about character pronouns as part of an example of play – and to leave the gamemaster’s identity as nebulous. (Lauren of course had to pick something, so she drew the GM as a woman/femme-presenting person, and I’m super cool with that.) I think that examples of play in writing, podcasting, and streaming are very important for showing acceptance and representation in our industry. I would like to see designers and broadcasters give a lot more thought to these examples. But the other choice I put into the writing was in how I chose to represent music and inspirational media in and around the game. From a design perspective, I chose elements of music that are universal: melody, harmony, rhyme, and rhythm. I did this instead of building the game around specific instruments or styles, because it’s absolutely vital that every type of music be possible in Rockalypse. 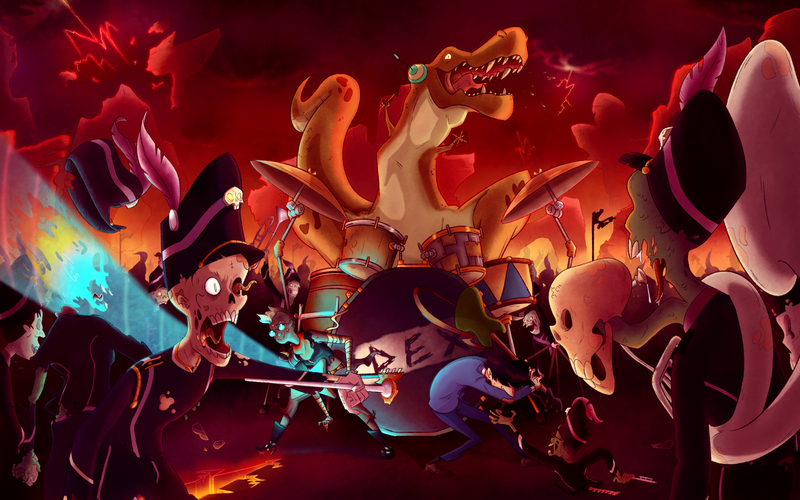 This isn’t just a game about metal or punk, and (despite the name) it’s not even just a game about rock. It is a celebration of rap, pop, folk, edm, classical, noise, disco, and more. If you browse through the list of visual media in the back of the book or listen to the entirety of the 30 Days of Rockalypse list, you’ll quickly see what I mean. And all of that is because dividing music into “good” and “bad” (or good and evil) by genre is almost always oppressive and frequently racist and classist. Keeping that out of the game was an important political choice for me. I hope that all of this provides a good example of how politics do affect play experience and also how carefully-considered choices can help to reinforce the consistency of that experience across the board. I also hope that those of you who have played Rockalypse feel that these choices come across clearly at your own tables. We look forward to talking about more games and their political choices moving forward!